I've used stamps by Stampendous. 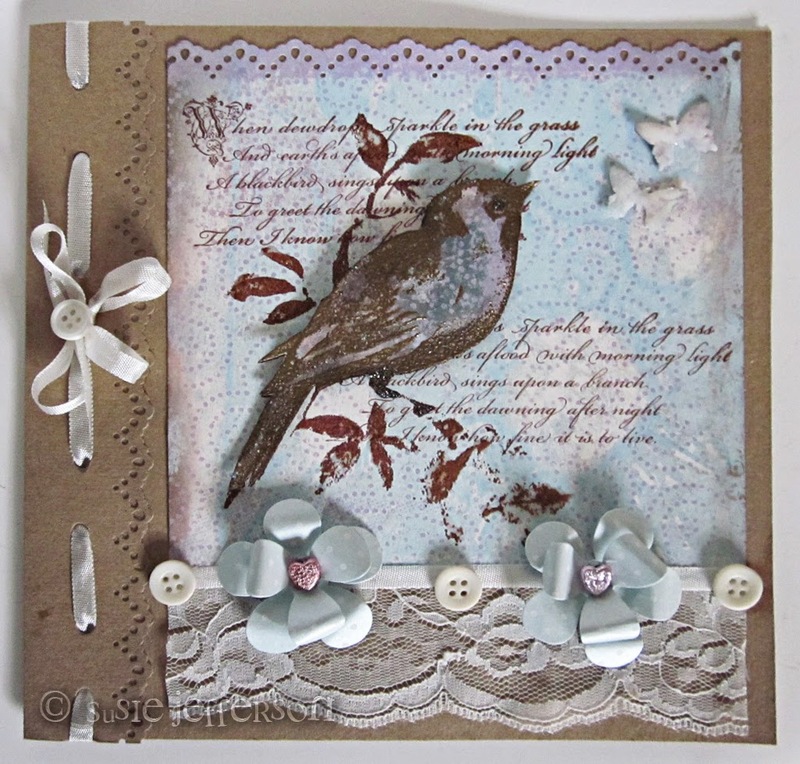 Plus Kraft card, an edger punch, buttons, a piece of lace and some seam binding ribbon. Anyone who's ever used a Gelli plate just raves about it - it's the easiest and most fun way to create your own unique monoprints EVER! I've created a lace edge on the card with a Martha Stewart punch. I thought you'd like to see a card I've made, using the Gelli Plate to make my own background papers - and this background is using some kitchen roll to create the texture! I've also made my own paper flowers from die-cut card. Tons of dimension: I stamped the bird directly onto the Gelli print background, and cut the paper down to size. I also stamped the phrase twice. 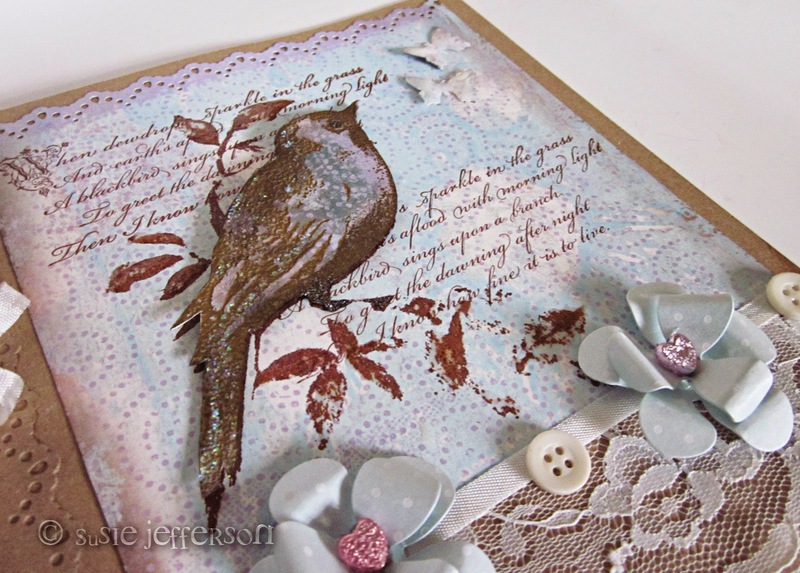 I then stamped the bird again onto the leftover Gelli background, this time using pigment ink, and embossed it. Finally, I cut it out, mounted it over the first stamped image using silicon glue, and added a little bit of Stickles glue for extra bling. I'm absolutely loving working with the Gelli Plate - so much you can do with it, using stencils, found objects, bits of old lace, draw directly onto the plate...so much fun, it's really addictive. I love to receive comments, and I read each & every single one! Thank you so much. Spammers please note - all comments are moderated, so your spam will not get through! Welcome to my blog - I hope you enjoy looking around. I love journaling, bookbinding, mixed media - and generally messing around with paint. Everything else is subject to change without notice! Susie Jefferson. Powered by Blogger.